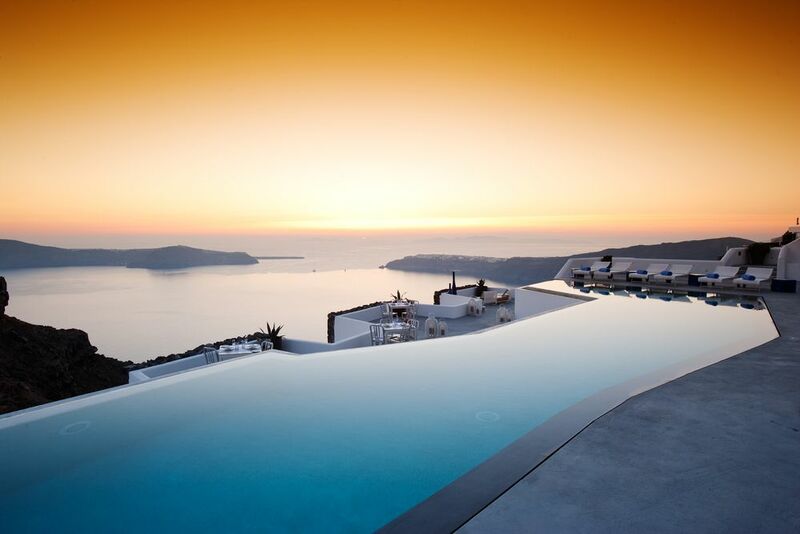 The infinity pool of the Grace Santorini is the perfect place to relax. 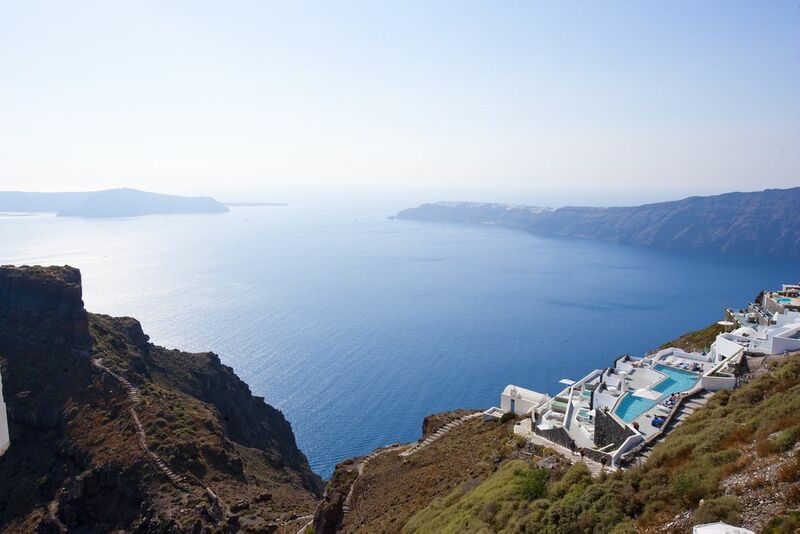 The Grace Santorini is located on one of Santorini's most beautiful bays. 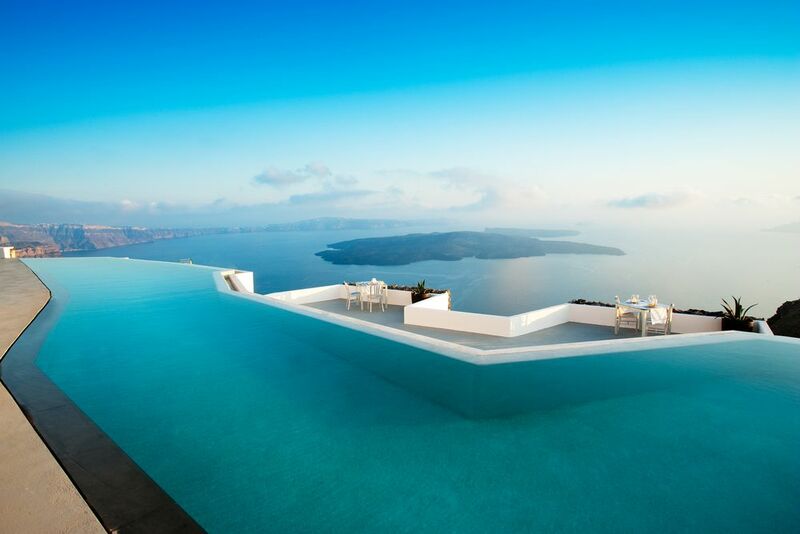 The Grace Santorini offers you the perfect view due to its location. The modern guest rooms are all white. Bright colors and contrasts make the rooms very comfortable. All rooms have a beautiful view of the Aegean Sea. The bathrooms at Grace Santorini are very spacious. Bright and open, you can let in the morning, the fresh Greek sea air. You can spend a relaxing afternoon on your private terrace. The villas of the hotel provide plenty of space to relax. Enjoy the spectacular views of the Aegean Sea. Here you are sure to spend a relaxing holiday. The Champagne Lounge promises, as the name implies, high-quality champagne and cocktails in a pleasant and noble atmosphere. 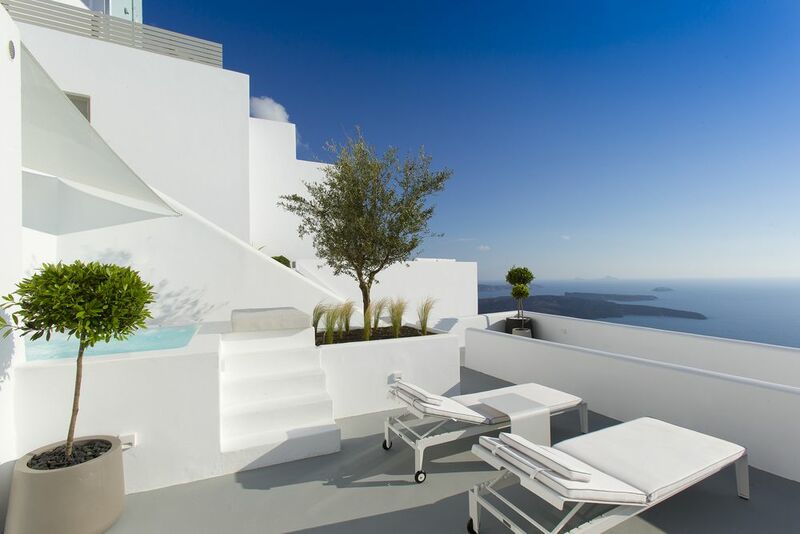 Indulge and let go of any responsibilities at the exclusive boutique hotel, Grace Santorini. Perched above the world-famous Caldera with breathtaking views and sumptuous sunsets, the hotel is individually decorated, bright and lovingly designed for the perfect romantic refuge. Imagine unforgettable views of the Cyclades and the turquoise waters of the Aegean Sea accompanied by the utmost luxury. Santorini is a place where ancient history of volcanic activity formed the island’s dramatic landscapes of today. Surround yourself with mystical sunsets, visit the volcanic rocks and hot springs by boat, discover the Santorini Arts Factory, explore around the ancient site of Akrotiri or learn about the local wine-making traditions—the possibilities are endless! Directly connected to the village of Imerovigli, you are surrounded by the typical white houses stacked upon the volcanic rocks of the Cyclades. Tradition and luxury make it a holiday you will never forget. Fira, the capital, is only 2 km away, the airport is about 8 km away. And the ferry port is about 10 km away. 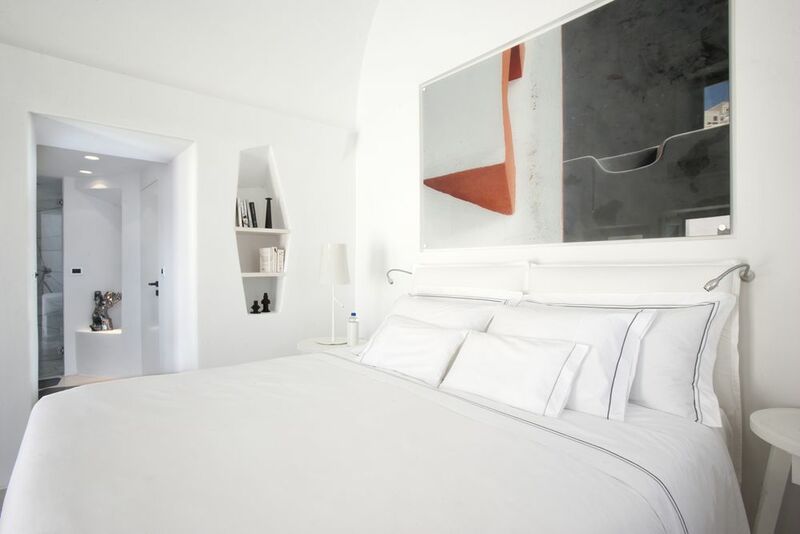 The charming hotel is ideal to combine with its sister hotel, Grace Mykonos. Due to the location and concept of the hotel, no children under 14 years old are allowed. Grace Santorini is the ultimate expression of a boutique hotel in Santorini—a true jewel of the islands, and one of the best in the Mediterranean. The iconic infinity pool offers uninterrupted sea views and the luxury accommodation has never been better situated. 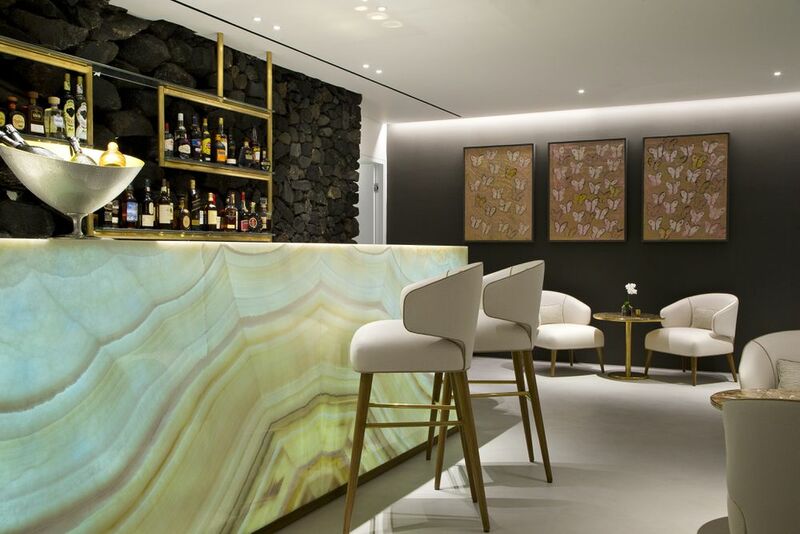 The hotel invites guests to experience the best Mediterranean fusion gastronomy and dining at its finest. Santoro is the open-air restaurant where magnificent sea views complement your Mediterranean fusion meal, or the moonlight shines upon your refreshing cocktail. They also have a champagne breakfast available each morning before your day of explorations. The new Champagne and Cocktail Lounge offers breathtaking views of the Caldera and it is the perfect place to relax while taking in the legendary Santorini sunsets with a delicious cocktail in hand. 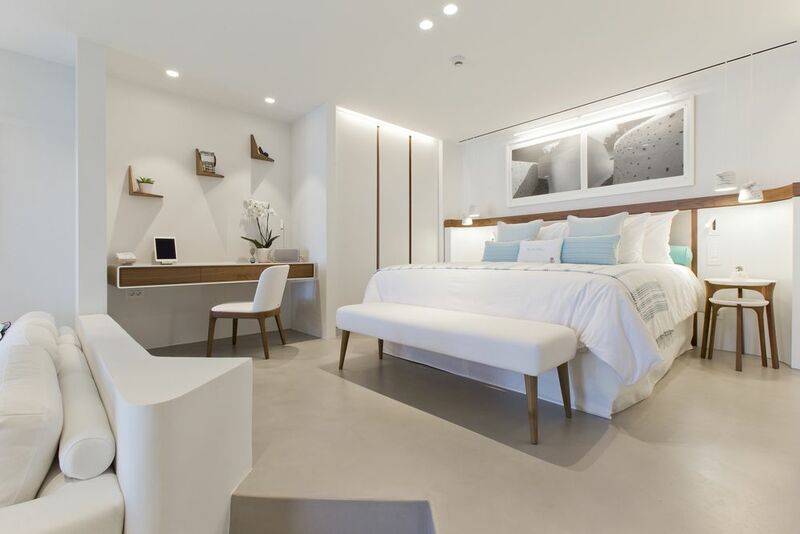 The 22 rooms and suites truly bring luxury accommodation in Santorini to new heights—the contemporary style combines with the cutting edge and bespoke design alongside the traditional handcrafted pieces. All rooms and suites open to impeccable views of the sea and breathtaking Cyclades sights. All rooms include a king-size bed and an in-suite bathroom with marble carved basins and spacious rain showers. Deluxe Room (32 sqm)—Kick back and relax in your outdoor seating area while enjoying breathtaking views of the Caldera from the comfort of your terrace. For a maximum of 2 adults. Deluxe Room with Plunge Pool (34 sqm)—The rooms’ terraces offer a private heated plunge pool and seating arrangement to enjoy the magnificent views. For a maximum of 2 adults. 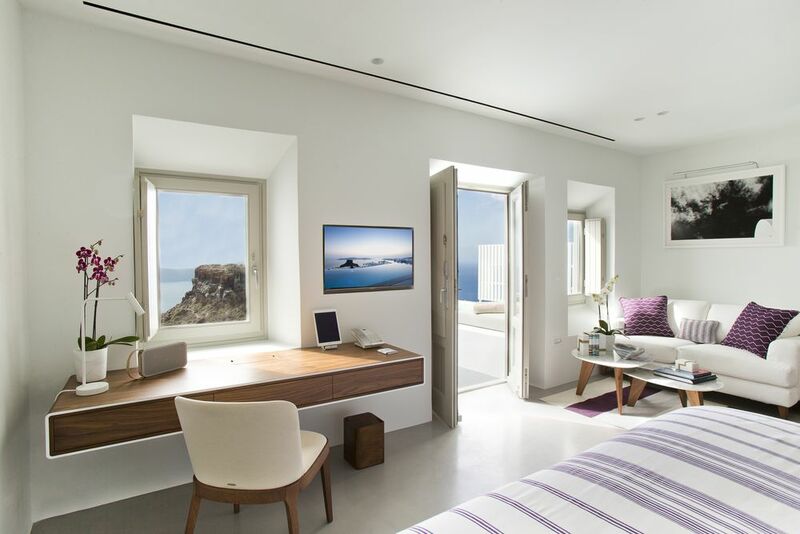 Junior Suite (45 sqm)—The spacious suites have a living room, bedroom and a terrace with outdoor seating to enjoy the Santorini views. For a maximum of 3 adults. Junior Suite with Plunge Pool (45 sqm)—With similar amenities as the Junior Suite, these terraces include a private plunge pool for ultimate relaxation. Honeymoon Suite (45 sqm)—Enjoy sensational sea views towards Thirasia Island, Oia and the Aegean Sea. The private plunge pool on the exterior terrace is the perfect place for uninterrupted views of the breathtakingly beautiful Santorini sunset. 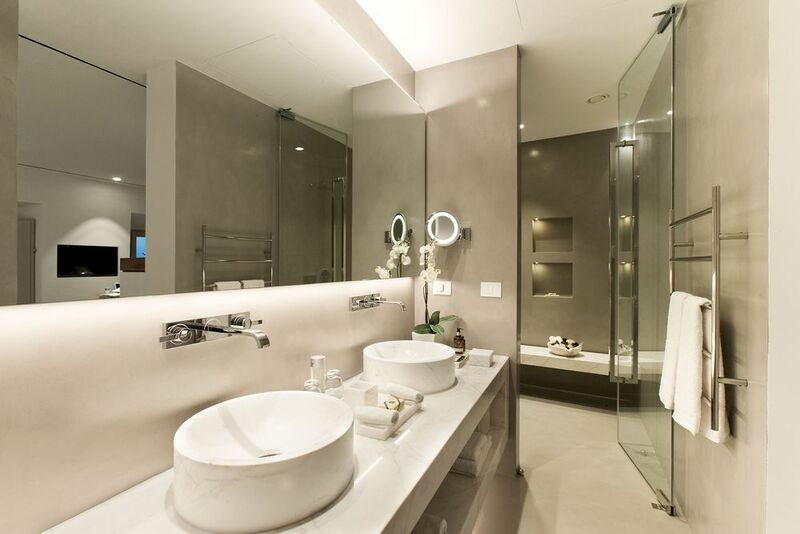 Special features include an in-suite bathroom with a shower for two and twin vanity units. Its private and secluded corner suite is at the lower level of the hotel for an ideal romantic getaway. Grace Suite with 1 Bedroom (63 sqm) or with 2 Bedrooms (102 sqm)—These perfect accommodations for couples feature a large, private terrace with outdoor furniture and an inviting plunge pool. This suite has a unique lava rock feature in front of a panoramic window, which adds to the privacy feel and creates wonderful light displays. For a maximum of 3 adults. Discover tranquility within your mind, body and soul in the comfort of your room/suite with the various spa treatments available. There is also a beautiful and newly built spa room guests may request. Desire to stay active even whilst on holiday? Guests have access to the small fitness room that meets all of your work-out needs! There are also Yoga and Pilates classes offered at the hotel.